On the leading edge of developmental and prototype stamping, Experi-Metal Inc. has, since 1959, honed its expertise to serve customers from automotive to aerospace, with nearly every sector in between. Positioning itself as a fully integrated world-class supplier and manufacturer of prototype tooling, low-volume metal stampings, trim moldings, specialty items, subassemblies and fully assembled bodies-in-white, Experi-Metal’s (www.experi-metal.com) use of advanced technologies allows it to help bring products to market with unprecedented speed. Company capabilities include sheetmetal stamping (max. press size 2000 mtons with a bed size of 96 by 180 in.) of various materials including, but not limited to, mild, high-strength low-alloy, dual-phase and stainless steel; aluminum; and Inconel. Experi-Metal also performs bending, using both manual tabletop and preproduction stretch benders, of rollformed sections and extruded aluminum profiles. Other capabilities: foam-pattern construction, kirksite casting, CAD die design, CNC machining with maximum work sizes of 78 by 236 in. and laser cutting with maximum work sizes of 84 by 168 in. The company also performs resistance, gas-metal-arc, gas-tungsten-arc and cold-metal-transfer welding along with other fabrication and assembly methods. Experi-Metal recently added to its arsenal, bringing hot-stamping capability under roof at its 250,000-sq.-ft. Sterling Heights, MI, facility. 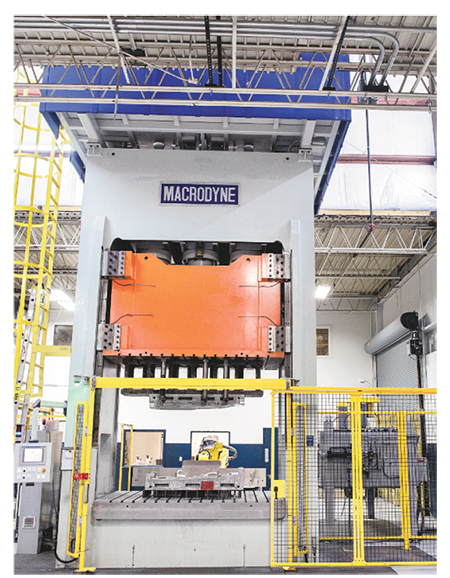 The new technology comes courtesy of Macrodyne (www.macrodynepress.com) and its 600-mton hydraulic press, customized to handle hot stamping, aluminum warm forming, deep-draw operations and general stamping. The varied capabilities of this press suit Experi-Metal to a T. Creating limited-run and one-off parts in various shapes and sizes, versatility permeates the company’s operations. It is fully ISO-certified for automotive and also holds AS 9100C certification for the aviation, space and defense industries—testament to the company’s prowess. This 600-mton press, anchoring the new manufacturing cell at Experi-Metal, has quite the range of capabilities, including hot stamping of steel, aluminum warm forming, deep drawing and general stamping. Heavily into prototyping for the automotive industry, Experi-Metal also manufactures a variety of aftermarket automotive replacement panels and assemblies for 1950s, ’60s and ’70s vehicles. It even manufactures full steel bodies for the 1932 and 1934 Ford three-window coupes and Tri-Five convertibles. It also holds the technology and experience necessary to engineer and manufacture complete body-in-white builds from vehicles of the past to next-generation concepts. Also, the company has manufactured a range of components for low-volume commercial vehicles. Hence the need for a press, as the signature piece of a workcell, with so many possible uses. That said, hot stamping was the main driver for this purchase, given its growing interest among automotive OEMs continually striving for high-strength/ low-weight ratios in the materials and parts they specify. It quickly became apparent that hot stamping requires specialized equipment—even with modifications, nothing on Experi-Metal’s roster filled the bill. With a new purchase in order, King and his team tackled the second requirement, that a hot-stamping press anchor a showcase manufacturing cell, letting customers know that Experi-Metal represented the state-of-the-art in hot-stamping prototyping while safely producing the best parts possible. Through recommendations by a customer, company officials visited Macrodyne in Toronto, Canada, and soon thereafter, in late-2013, completed a deal for a customized press to fit Experi-Metal’s criteria. 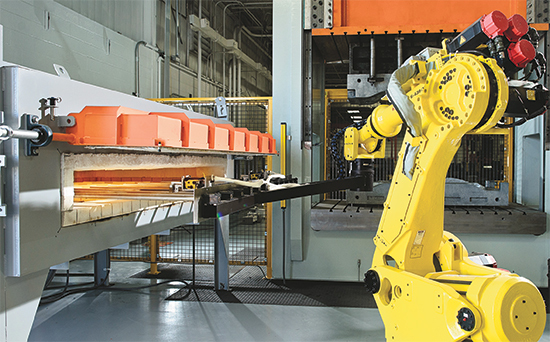 The new press cell came online in the summer of 2014, complete with a blank-loading table, part-handling robot and oven. Macrodyne installed the press and assisted with integration of the various cell components. Featuring a stroke length of 47 in., at full tonnage the new press can reach speeds to 60 strokes/min. Its Allen-Bradley control package provides comprehensive features including programmable pressing and stripping tonnage, slide position control and monitoring, slide return on position or tonnage, multi-mode capability, part-parameter storage, programmable dwells, cushion control functions, jog functions, slide-lock functions, extensive fault diagnostics, preventive maintenance screens, multiple user levels and remote diagnostic capability. “We can run the press all of the time on a large percentage of our work,” reports King, with a nod to the system’s flexibility. Enhancing that flexibility, a hydraulic cushion also supplied by Macrodyne matches Experi-Metal’s need for a 12-in. stroke and cushion-pin spacing that replicates trays on other presses. A fully outfitted onsite metallurgical lab supports steel hot stamping and aluminum warm forming at Experi-Metal. Many prototype stamping facilities don’t have this capability onsite, so must send samples to offsite labs, with results taking overnight or longer. “With our lab,” says Gerry King, Experi-Metal vice president of engineering, “we have material results prior to producing parts. By testing the first part in the morning, we won’t run parts all day, and then, if the characteristics aren’t correct, have to scrap an entire day’s worth of production—or worse yet run the risk of nonconforming products reaching the customer.” Additional met.-lab testing is performed at various intervals throughout the production run. 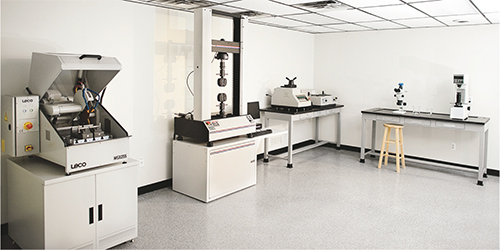 To differentiate itself from other hot-stamping prototypers, Experi-Metal has invested in a fully outfitted metallurgical lab. “With PHS, we are not just a stamper, but a heattreater,” says King, explaining the decision to construct the lab. As he notes, to achieve the proper martensitic characteristics for hot stamping, managing and repeating the entire manufacturing cycle is critical. King provides an outline of a typical hot stamping “recipe” used by Experi-Metal: the cycle initiates when the steel blank is picked up via robot transfer from the material load station then placed into a preheated oven. The oven must maintain a closely controlled environment, and the steel must be heated to a specific temperature then soak for a specified window of time. The heated steel then transfers again via robot from the oven to the press. Here it is formed within the approximate 9 to 12-sec. cycle time while maintaining a dwell under tonnage for a specified timeframe until the material is cooled or quenched to proper temperature. Most prototype stamping facilities don’t have this capability onsite, so they must send samples out to offsite labs. Results may take overnight or longer. Additional met.-lab testing is performed at various intervals throughout the production run. Heavily involved in hot forming, Experi-Metal is experimenting with related processes, such as aluminum warm forming, which also can be performed in the new press cell. Whereas steel heats to about 1700 F for hot forming, aluminum typically heats to approximately 600 F during warm forming. Both processes find use in imparting strength to the materials, and aluminum should continue trending upward in automotive applications as challenges related to this notoriously difficult to shape material are tackled. Down the road, the company may explore titanium hot forming, in the same press cell, for aerospace applications. With Experi-Metal’s signature press cell humming along and advancing the boundaries of unique process technologies while meeting the company’s varying metalforming needs, King expresses satisfaction with the choice of equipment. See also: Experi-Metal Inc, Macrodyne Technologies, Inc.